The Leverhulme Trust has awarded a 36 months research grant for the project Living interfaces based on non pathogenic bacteria to control stem cell differentiation. Schematics of engineered bacteria with adhesive ligands (FNIII7-10) as membrane proteins that express a growth factor (GF) as a membrane protein in response to external stimuli (inducer). This project will further develop our “living biointerfaces” concept with non-pathogenic (food-grade Lactococcus lactis) bacteria that have been genetically modified to express in a time or stimuli controlled manner desired adhesive proteins and factors to a living cell population. These bacteria will be modified to both continuously express a fibronectin fragment (a GFP tagged FNIII7-10 fibronectin fragment) and, on-demand, express growth factor BMP-2 as membrane bound proteins (compared to excretion of free BMP-2). With these bacteria population we plan to test that this bacteria biointerface systems allow stem cell adhesion and then promote stem cell differentiation towards the osteogenic lineage. Myogenic differentiation on living biointerfaces. 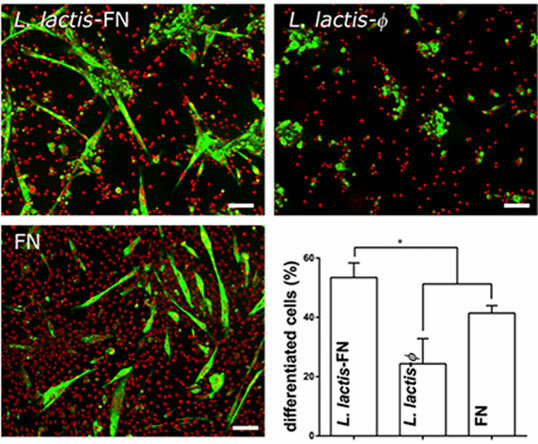 Sarcomeric myosin-positive cells (green) and nuclei (red) on bacteria expressing FNIII7-10 (L. lactis-FN); control bacteria (L. lactis) and FN-coated glass .